The Wofford Terriers scored 14 points off two VMI Keydet third quarter turnovers and went on to a 41-20 win in Southern Conference football action Saturday at Foster Stadium in Lexington. The contest was extremely close at 21-17 until a Wofford (4-5, 2-3 SoCon) punt hit VMI (2-7, 1-4) hit Dane Forlines in the foot with eight minutes left in the third quarter. The Terriers recovered and scored just four plays later, as they would off a Derrick Ziglar fumble that occurred on VMI’s next drive as Wofford went up 35-17. Only nine total points were scored the rest of the way as the turnovers proved to be the game’s crucial plays. Al Cobb led the way for the Keydets with a 35 of 52, one interception day. Cobb threw for 370 yards and his 35 completions set a new school record, surpassing the previous mark of 34 that he shared with Eric Kordenbrock. Aaron Sanders chipped in with 10 catches for 164 yards. For Wofford, two different players, quarterback Evan Jacks and running back Nick Colvin, both exceeded 100 yards as the Terriers piled up 405 yards on the ground. The two teams, in fact, were within two total yards of each other – 421 to 419 – making the third quarter turnovers even more critical. The Keydets started things with a bang on the cool, clear fall day, as Greg Sanders returned the opening kick 99 yards for a touchdown. It was the first kickoff return for a touchdown for the Keydets since Tim Maypray brought one back in 2007, and it gave the Keydets a 7-0 lead. That would be VMI’s only lead of the day, as Wofford tied the game on a nine-yard Lorenzo Long touchdown run with 2:56 left in the quarter and went ahead early in the second, when Chase Nelson scampered in from one yard out to put the visitors up, 14-7. Dillon Christopher capped the first half scoring with a 20-yard field goal as time expired, making it a 14-10 Wofford lead at the break. The Terriers scored just 43 seconds into the second half, thanks to a 19-yard run by Hunter Windham, but the Keydets came back with an 11-play, 73-yard drive that Cobb himself capped with an 11-yard scramble to make it 21-17, Wofford. That would be VMI’s final touchdown of the day, as Forlines suffered the muffed punt on the next WC punt to set the stage for the two game-breaking turnovers. 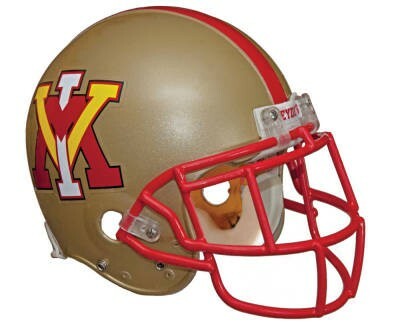 Christopher booted through a 32-yard field goal early in the fourth quarter to pull the Keydets within 15, 35-20, but the Keydets could draw no closer. Jacks notched an eight-yard touchdown run in the final minute to account for the final margin. VMI football will return to action next Saturday, when the Keydets face The Citadel in the Military Classic of the South. Kickoff in Charleston, S.C. is set for 2 p.m.
Press Conference: VMI Head Coach Scott Wachenheim “Hats off to Wofford and Coach Ayers. I thought they came in and did a tremendous job. We knew this would be a tough, physical ball game and they didn’t disappoint us – they definitely made it tough and physical. I think the story of the game was turnovers. They had been turning the ball over coming in to the game and today they did not. I thought the story of the game was also third down conversions. They were 7 of 14 and we were 1 of 12. They were able to maintain possession on a couple of drives and we were not. You can’t turn it over as many times as we did and get none in return and expect to win any ballgame. That showed true today. We kept fighting to the end. Things weren’t going our way all game. The officials ruled that we did not have the ball on the opening (onside) kick in the second half. We just have to rally at that point and keep them out of the end zone.